Sarcoptic mange is the most common type of mange in dogs. It is a skin disease caused by host-specific strains of the burrowing mite Sarcoptes scabei. The strain that affects dogs is Sarcoptes scabiei var. canis. The most commonly used tests to diagnose scabies are skin scrapings, which aim to scrape out a few mites from their skin 'burrows'. These mites can then be identified when the scraped sample is examined under a microscope. The preferred areas for skin scrapings are the elbows, hocks, and chest, as there is a higher chance of finding the mites there. Ear tips are sometimes scraped too. "Unfortunately, Sarcoptes mites are very difficult to find... only about 20 per cent of cases will have a positive scrape." Unfortunately, Sarcoptes mites are very difficult to find. If a single mite or egg is seen, this confirms the disease, however if none are found, this does not rule sarcoptic mange out. In fact, only about 20 per cent of cases will have a positive scrape. Another common sign indicatings the presence of Sarcoptes mites is the 'pinnal-pedal reflex' (Pinna is the ear flap, pedal is the hind foot). This involves rubbing the ear margin between the thumb and forefinger in the hope of eliciting a scratch reflex with the hind leg on the same side as the ear. If positive, this is highly suggestive of scabies and occurs in around 75 per cent of cases. All in-contact dogs and cats must be treated, as the disease is highly contagious. The mites on infected animals must be killed and any bacterial infections treated with antibiotic medications. 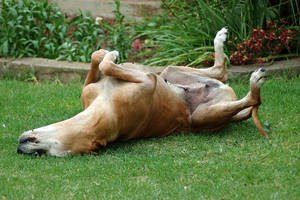 For severe itching, veterinarians will often prescribe anti-inflammatory medications to provide some relief. Estimates of how long the mites can survive away from a host vary widely, from less than 24 hours up to three weeks. So, while in a worst case scenario mites will be virtually eliminated from the environment within a couple of weeks, it is still advisable to treat the environment and the pet's bedding to speed the death of the mites. There are a number of treatments used to kill the mites. 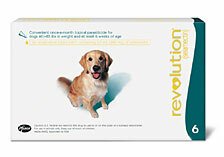 Selamectin (Revolution): Two monthly treatments are required for the treatment of sarcoptic mange in dogs. Trials in the US and Europe demonstrated that, based on skin scrapings, the efficacy of selamectin against Sarcoptes infestations on dogs was greater than 95 per cent by day 30, and 100 per cent by day 60. Fipronil (Frontline) has a claim to "aid in the control of" scabies. Amitraz washes and dips, such as Demadex Acaricidal Dog Wash and Mitaban, are also approved for the treatment of sarcoptic mange. For maximum effect, the dog should completely clipped of all hair and bathed in a shampoo which cleans out the pores of the skin and encourages the mites to move towards the skin surface prior to treatment with a dip. Shampoos containing benzoyl peroxide are ideal for this pre-wash. The dip solution should be diluted to the appropriate strength with water, then applied with a sponge to ensure the animal is thoroughly wet. After application, the dog should not be rinsed or towel dried but either air dried or dried with a blow-drier. Normally three to six treatments will be required to cure the dog. These dips can be toxic, so great care should be taken when using them. Weekly applications of lime sulphur for five or more weeks are safe and effective, but the product has a foul odor. While not approved by the FDA, ivermectin and milbemycin oxime have been used by some veterinarians with reported success. Revolution? is a registered trademark of Pfizer Inc.
Frontline? is a registered trademark of Merial. Mitaban? is a registered trademark of Pfizer Inc.